These sugar pumpkins are 0.69 per pound at my local grocery store right now. The best part is they only weighed 2 lbs! Great price. 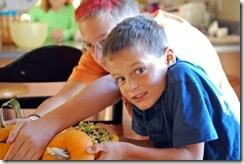 This is how you can turn your sugar pumpkins into your bowl… The kids had fun with this one. scoop out seeds (so much easier than scooping out a Jack-O-Lantern! Place pumpkins in oven safe dish with pumpkin lid. Bake at 410 for 30 minutes. 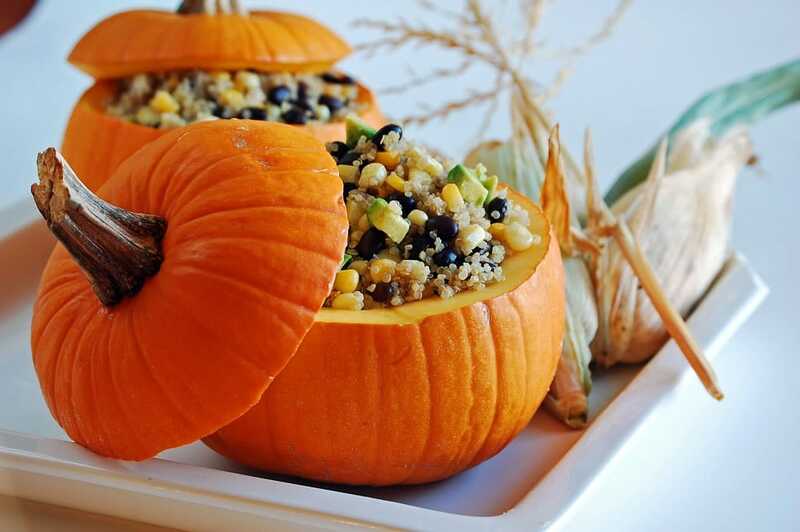 Take out of oven , drain water, and fill pumpkins with stuffing. You can fill the pumpkins with soup, or any sort of rice concoctions. Our Stuffing was: Quinoa and Black Beans. We’ve modified the Allrecipes recipe just a bit, so now it looks like this. Sauté onion and garlic in oil. Add Quinoa, broth, cumin to pan. Bring to a boil. Cover and simmer for 20 minutes. Add corn and black beans when Quinoa is cooked. Here are my kids fighting over the “smaller” pumpkin. What will you stuff your pumpkins with? Scoop out seeds (so much easier than scooping out a Jack-O-Lantern!). Pour water into bottom of dish. Bake at 410 degrees for 30 minutes. 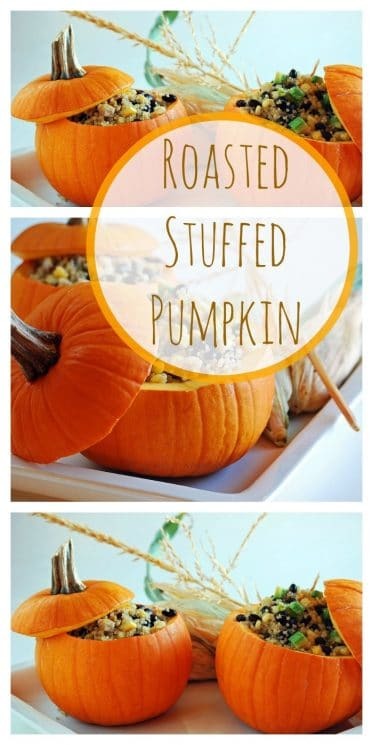 Take out of oven, drain water, and fill pumpkins with stuffing. 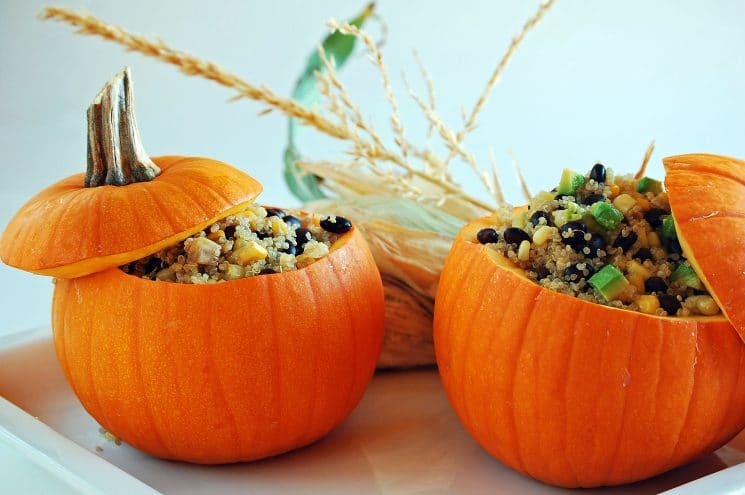 You can fill the pumpkins with soup, or any sort of rice concoctions. Our Stuffing was: Quinoa and Black Beans. Add Quinoa, broth, cumin to pan. Bring to a boil. Cover and simmer for 20 minutes. Add corn and black beans when Quinoa is cooked. I tasted quinoa for the first time this month. It was pretty good. This is a cute idea and it looks really good. Thanks for the recipe. Yummy! Why do I come to your blog and just drool all over.. everything you post sounds so delish! I love your idea! I’ve been craving some pumpkin soup though! Maybe I’ll fill it with that! 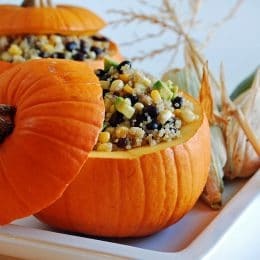 I posted about ten pumpkin recipes lately, but this one is amazing! I would love to see this big juicy pumpkin at our table and everyone digging into it: how fun! I am thinking brown rice with some pine nuts and cranberries would be great. Maybe an odd question, but it the pumpkin decorative, or do you eat the pumpkin? the taste of the tea.